Fall is the most active time of year for deer while they are in their breeding season. Their paths cross roadways and highways and they are somewhat distracted with the need to find a mate. This is not a good combination when you factor in the heavy traffic on our roads. Deer car accidents result in tens of thousands of injuries, astronomical car repair cost and death. Although deer collision statistics vary from state to state, the majority of deer accidents occur in the Midwest. However, no matter where you live, you should be aware of possibility of colliding with a deer. The most prevalent time most deer collisions occur are from dusk to dawn so being prepared can help to prevent you from experiencing this. High beams can help you spot a deer faster since their eyes will reflect in the light. Use your bright lights if no other cars are coming toward you. Pay attention to deer crossing signs. These are put in areas known for high deer traffic so being extra alert in these areas is a good idea. If you are driving on a road with multiple lanes, drive toward the center of the road. This gives you more time to react if you see a deer run out onto the road. Honk your horn. Some experts recommend honking your horn for a prolonged blast will eventually scare the deer off the road. That may or may not be true, but honking your horn can’t hurt. If you see a deer, do not swerve to miss it. You could lose control, hit another vehicle, hit a tree, or hit a guardrail. If it appears you are going to hit the deer, apply your brakes firmly and lift your foot off the brake before you collide. This will reduce the chance of the deer going through the windshield. Get the car off the roadway, but leave your hazard lights on. Call the police and get a report filed as you would with any other accident, especially if the animal’s body is blocking traffic, or if there is vehicle or property damage. Stay away from a downed deer. They are wild animals and it might be wounded. Flailing legs and hooves can hurt you. Check your car. 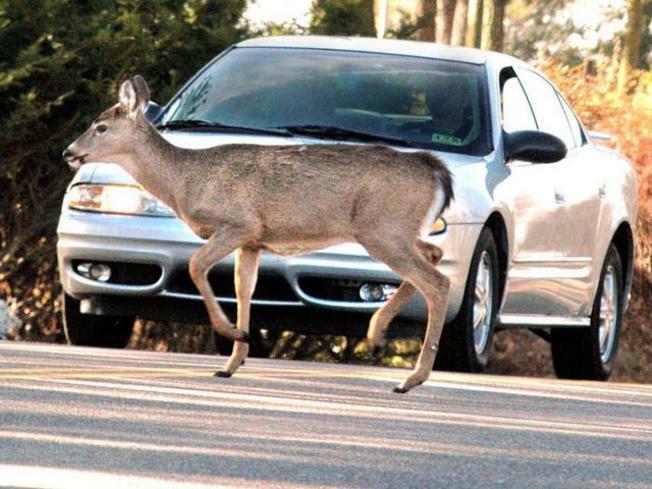 Collision with a full-grown deer might cause damage that makes your car unsafe to drive.